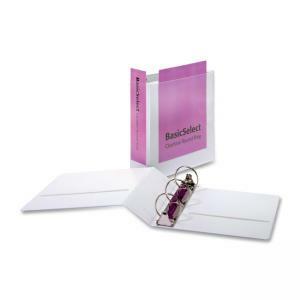 Round-ring binder features a PVC-free material that will not stick to cover inserts or materials stored inside. Material is archival-safe for all documents including photos and offers superior, cold-crack resistance to 5 degrees Fahrenheit. Nonglare clear overlay holds custom title sheets. Back-mounted, metal rings with dual opening and closing triggers allow sheets to lie flat. Binder also includes horizontal pockets on the inside front and back covers. Use free online templates to customize.